This door system allows both door leaves and side panels to be swivelled outwards by 90° using (adjustable) pressure from the inside. The leaves and panels can then be placed to the side. The total opening system is recommended for use in escape and rescue routes and for buildings with vehicle traffic or bulky items. 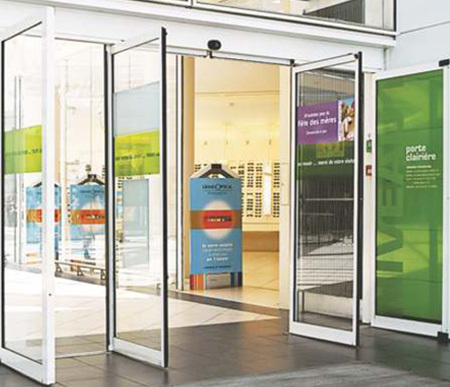 For all areas used by the public requiring practical, safe solutions for both inside and outside buildings, such as: airports, markets, retail outlets and shopping centres, car parks and garages, exhibition centres, trade fair complexes,hospitals and office buildings, restaurants and hotels, industrial sites. 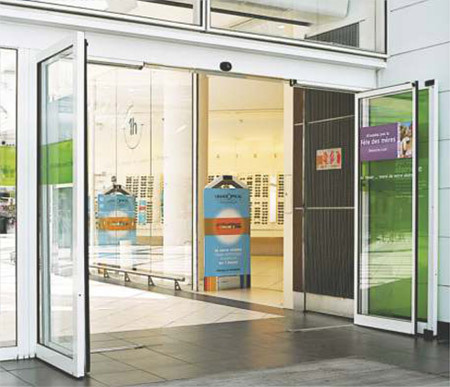 This model can be used as any normal sliding door, but also for escape routes and as a practical total opening door with swivelling door leaves.